I was sent two router bits to compare. One is a famous name bit and the other is a bit that claims to be better. Executive summary: The less expensive, less famous bit is better quality is several areas. However both are good bits and the only serious defect is the gouges in the shaft of the famous bit. 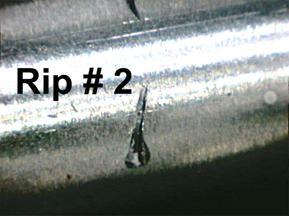 Above are the two rips in the metal of the famous bit. 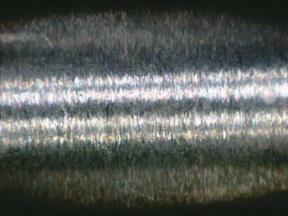 These are gouges (also called upsets) perhaps caused by the engraving tool since the engraved logo was poor quality. These are totally unforgivable. 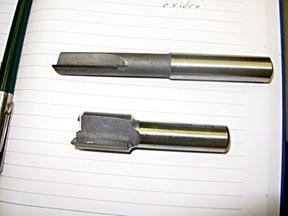 They interfere with a secure fit of the shank into the collet and will damage the collet. The surface on the famous bit above is smooth while the competition is rougher. In this case rougher is preferred since it will give a better grip. 2. 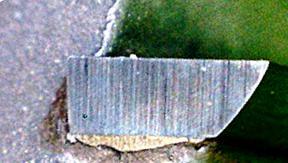 Brazing - The brazing on the famous bit drew back into the gap which raises the question if the steel and carbide were prepared properly. 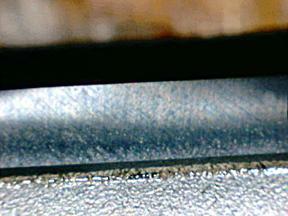 The brazing on the competitor flowed out onto the steel which suggests properly prepared steel. 3. Grinding – the famous bit was ground with a coarser wheel. The less famous bit has vertical, very fine grind marks. 4. The famous blade has a straight top while the other has a rounded top. (The top is on the right of the picture.) The rounded top is sometimes called a “waterfall” grind and is generally considered superior as it allows for better control of fiber spring back. Sides of the bits. Famous left and competitor right. There appears to be too little braze alloy on the famous bit. 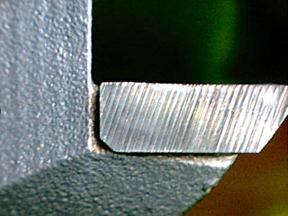 A thick layer of braze alloy (0.003” to 0.005”) greatly cushions the bit and allows for better cuts with longer life.